Just as he had done so many times this season, senior quarterback James Brady held onto the ball until he could no longer. Then he sprung the trap — at the expense of his own body. With Mount St. Michael Academy defenders closing in Sunday night, Brady waited until the last possible second and then pitched the ball to his left and into the hands of junior running back Nicholas Mercurio. Brady paid a price, taking a physical wallop. But so did Mount St. Michael. The aggressive Mountaineers defense suddenly found itself outflanked. Mercurio blew through a seam untouched and didn’t stop until he reached the end zone 39 yards later. His breakaway touchdown with 4:37 left in the CHSFL Class AAA championship game set off an eruption of euphoria on the St. Anthony’s sideline. And the ensuing two-point run by Atiq Lucas put the final touches on a rousing 26-20 come-from-behind victory. No. 7 Mount St. Michael made one last drive inside the Friars’ 20 in the final minute, but quarterback Jayson Holt was stopped 1-yard shy of a first down at the 16 with 46 seconds left, allowing the St. Anthony’s faithful to exhale. Mission accomplished. Top-seeded St. Anthony’s (10-1) stunned the Mountaineers (5-6) in the title game for the second straight season to capture the program’s seventh straight CHSFL crown and 10th overall. And to think, many naysayers piled on when the Mountaineers handed St. Anthony’s a 22-12 loss in the Bronx Week 3. The defeat snapped the Friars’ 64-game league winning streak. But these Friars shook off the setback and kept the dynasty alive and thriving as they celebrated on the turf at Hofstra’s Shuart Stadium. While Brady was masterful orchestrating the offense, it was emerging junior Atiq Lucas who delivered once again. He rushed for 42 yards on nine carries, added three catches for 53 yards, scored on a lightning 25-yard end around and added a two-point conversion. Another gifted back, senior William Ruggiero, pieced together a workmanlike effort. He managed 39 yards on seven carries and scored on runs of 2 and 9 yards. Mercurio finished with 61 yards on five attempts. That diversity and depth, along with a hard-nosed offensive line, paved the way to success. The defense surrendered 194 yards and two touchdowns on 22 carries to the elusive Holt, but St. Anthony’s did just enough to negate his stirring effort. The D came up with two fourth-quarter fumbles and stopped the Mountaineers twice inside the red zone in the final minutes. With the teams deadlocked at 12, Mount senior running back Isiah Moody took the opening kickoff of the second half 97 yards up the right sideline. Holt hit Thomas Cardona on a pass into the end zone for the two-point conversion and a 20-12 Mountaineers lead. A big return on the ensuing kickoff by J.B. Andreassi set up the Friars at their own 48. Brady marched St. Anthony’s the rest of the way, capped by Lucas’ mad dash for a 25-yard score to close the gap to 20-18. Brady’s two-point pass was broken up, and so the Friars still trailed into the fourth quarter. But the defense, led by Scott Vallone, turned up the heat. Vallone recovered a Holt fumble at the Mount 39 with 4:50 left. Mercurio took the next play to the house. And the St. Anthony’s legacy of gridiron greatness continues. With Rutgers coach Greg Schiano looking on from the St. Anthony’s sideline, his prized recruit put together a memorable performance in his final game in a Friars uniform. Defensive tackle Scott Vallone corralled Mount St. Michael quarterback Jayson Holt on fourth-and-9 from the St. Anthony’s 22-yard line. It took two St. Anthony’s teammates to finish off Holt, but the Mount quarterback eventually went down 3 yards shy of the first down. Credit Vallone, who also recovered a critical fourth-quarter fumble, recorded two sacks and finished with nine tackles. That’s championship football. Schaino must have been proud. The St. Anthony’s defense turned away Mount St. Michael in the red zone twice in the final 10 minutes. With The Friars trailing 20-18 with 9:16 left, junior defensive end Rafiq Wallace crashed through the line and slammed into Mount St. Michael quarterback Jayson Holt, knocking the ball free. Junior linebacker Paul Alessandri recovered the fumble at the Friars’ 13. Not only did it keep the Mountaineers off the scoreboard, it gave the Friars momentum going into the final minutes. James Brady clearly appreciates his place in the hierarchy of the high school food chain. The St. Anthony’s senior sports sunglasses in the school hallway as if trying to evade paparazzi. He donned a Superman sweatshirt on Halloween. Swagger and cool simply radiate from the 6-1, 215-pound Brady. He’s nailed the quarterback persona. Think Joe Namath back in the day and you begin to understand how completely at home Brady is in his own skin. That’s not easy when you play the most high-profile position for the state’s foremost football factory. Style points don’t win games. Quick feet and even faster thinking are required to run the St. Anthony’s spread option attack. Brady also has a cannon arm. He throws a picture-perfect deep ball. These are all tools that help Brady get the job done. But what ultimately defines him on the field is the fierce determination he brings. He attacks defenses with little regard for his own body. “I want the ball when it comes down to it,” said Brady, who was a promising baseball player on the Deer Park junior varsity as an eighth grader. Brady is all but impossible for any one defender to corral. The St. Anthony’s senior is elusive enough to shake a linebacker and strong enough to bulldoze an opposing tackle. Little wonder Brady has played through an assortment of injuries in his two seasons as a starter. Little wonder the Friars are 9-1 and playing in the CHSFL Class AAA title game once again. Brady wouldn’t have it any other way. On a team 87 members deep, featuring several playmakers and college-bound talents, there is one indispensable standout. He is a leader and an inspiration. During a season defined by injuries and illness to several key offensive stars — the Friars are currently without their top running back, wide receiver and guard — Brady has held the unit together. In Brady we trust is all the currency the Friars need. And yet Brady’s career exists in a bubble. He is the guy who took over for Chris Eanuzel, who became the first CHSFL player to win the Hansen Award as Suffolk’s best player since 1986 and is regarded as the best quarterback in St. Anthony’s history. All Brady did as a junior was go 10-0, completing 60 percent of his passes for 1,600 yards and 10 touchdowns while rushing for 500 yards and four more scores. He led the Friars to a 21-20 win over Mount St. Michael in the CHSFL title game, completing 14 of 21 passes for 276 yards and engineering a 99-yard scoring drive to seal the win. He’s completed 56 percent of his passes for nearly 1,200 yards and 7 touchdowns while rushing for 500 yards and six scores this season. Even if Brady brings home a second championship with a win over Mount St. Michael — finishing his career 20-1 — there’s nothing he can do to supplant Eanuzel in program lore. That’s OK because Eanuzel taught him so much about the position. It’s not just his place in school history that remains open for debate. But in possibly the deepest class of signal callers Long Island has ever seen, Brady is just one in a group of talents that includes: Central Florida-bound Rob Calabrese (East Islip) and Hofstra commitments Joe Sidaras (Floyd) and Stephen Probst (Farmingdale). Good thing Brady isn’t concerned about legacies. “There’s always someone better than you out there,” Brady admitted. For all his celebrity, Brady has an entourage of one. Center Austen Fletcher is Brady’s bodyguard on the field and shadow off it. Senior safety J.B. Andreassi, as intense as Brady is cool, occasionally makes it a trio. They are hardly the Rat Pack. Their idea of fun is ordering the never-ending pasta bowl at the Massapequa Olive Garden. Brady has also put recruiting on hold until after the season. That’s not a decision many coveted players would make. Brady has received heavy interest from Army, Georgetown, Lafayette and Princeton, and Big-12 force Missouri has been in the mix. Whatever his ultimate destination, Brady will make his presence felt. Rematches don’t get much more exciting. Throw out the records in this one. They certainly didn’t matter the last time St. Anthony’s and Mount St. Michael Academy football teams faced off Week 3. Remember? The Friars took a national ranking and a 64-game CHSFL winning streak dating to 1998 into the Bronx. And Mount struck for three first-quarter touchdowns en route to a 22-12 win in the rain and mud. Their respective seasons diverged from there. St. Anthony’s (9-1) rebounded while the Mountaineers (5-5) struggled. And yet, fittingly, here they are in the CHSFL Class AAA title game. The playoff history between St. Anthony’s and Mount St. Michael runs deep. But you have to dig deep to find it. 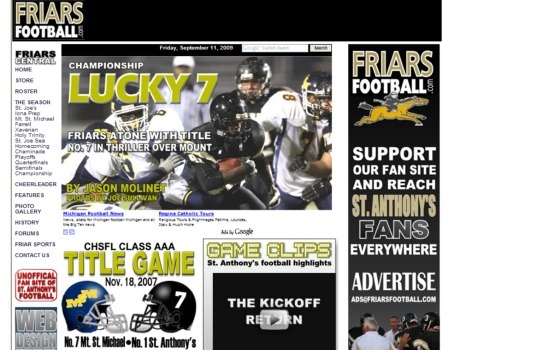 Yes, the programs faced off in the title game a year ago, a 21-20 thriller won by the Friars. That marked the first playoff meeting between the rivals in seven seasons. But these teams have a past. This will be the 10th playoff showdown between the programs — all since 1987. St. Anthony’s leads the series 6-3, with four of those games each decided by a single point. The only history that matters to the kids on the field are the last two years. Just take the signal callers. 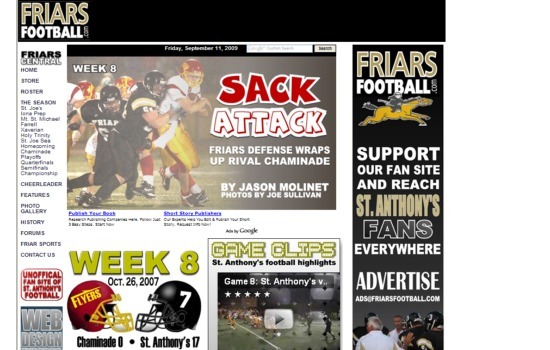 The Friars rallied behind James Brady (check out the feature on Brady here) to win the title last November. Jayson Holt, the Mountaineers’ quarterback and kicker, had an extra point blocked in the waning moments of that game. Don’t think it wasn’t on his mind when the teams met earlier this season. Holt did as much as anyone to sink the Friars that day. Meanwhile, Brady saw his fumble scooped up and returned for the decisive touchdown in his only loss as a starter. Don’t think that won’t be on his mind Sunday at Hofstra. Who will write the next chapter in this intense rivalry? THE SCOOP: Top-seeded St. Anthony’s held off No. 5 Iona Prep, 23-20, while No. 7 Mount St. Michael upset No. 6 Chaminade, 16-8, in CHSFL Class AAA semifinal action. It sets up a rematch of last season’s title game won by St. Anthony’s. It also pairs the Friars with the lone league mate to have beaten them over the span of 64 games. Mount St, Michael handed St. Anthony’s a 22-12 loss in Week 3. Stopping Mount senior quarterback Jayson Holt, an elusive runner, is the key for the Friars. Iona Prep senior quarterback Ryan O’Neil and his reputation as the most prolific passer in the CHSFL didn’t mean much to a St. Anthony’s defense that manhandled him Week 2 and had rarely been beaten deep this season. Once again, the 6-2, 170-pound O’Neil took a beating each time he dropped back to pass Friday night against the Friars. But he also beat them deep and nearly ended the Friars’ seven-year run on top. O’Neil completed 24 of 39 passes for 325 yards and three touchdowns — all to speedy junior wideout Chris Alfano. The defense did just enough to stymie No. 5 Iona Prep, turning away the Gaels at the goal line in the second quarter and sacking O’Neil on fourth down with 58 seconds left as top-seeded St. Anthony’s pulled out a 23-20 win in a CHSFL Class AAA semifinal before a rain-soaked crowd of 800 at Cy Donnelly Field in South Huntington. St. Anthony’s (9-1) will face the Chaminade-Mount St. Michael winner for the title next weekend at a date, site and time to be announced on Monday. The Friars are the six-time defending champions. Credit St. Anthony’s senior quarterback James Brady for carrying the offense. The team piled up 243 yards on the ground, led by Brady. He ran for 111 yards on 19 carries and scored what proved to be the game-winner, a 25-yard burst with 11:50 left. Nicholas Ferrara’s point after attempt made it 23-14. Brady also completed 5 of 13 passes for 112 yards. The offensive line did its job, as usual. But what really made all the difference for the Friars was the relentless fashion in which James Brady, William Ruggiero and Atiq Lucas carried the ball. Each churned out second-effort carries that had to be deflating to the Iona Prep defense. Brady finished with 111 yards on 19 carries and a 25-yard touchdown run. Ruggiero plowed ahead for 94 yards on 11 carries and a 2-yard score. Lucas added 71 yards total offense, including 35 yards on three carries. He turned a counter into a twisting 23-yard touchdown, shaking off a myriad of defenders. The Friars’ second-quarter goal-line stand probably saved the season. Iona Prep drove 63 yards — highlighted by a 28-yard strike from Ryan O’Neil to Tim Murray — to the St. Anthony’s 5-yard line. Jeffrey Mack carried the ball 4 more yards, setting up second-and-goal from the 1. Iona Prep tried to shove the ball down the throat of the Friars’ defense on each of the next three plays. The last, a blast off right tackle by Darlos James with 6:40 left, was stuffed by a wall of back and gold. Not only did James get stopped short, he was hurt on the play. THE SCOOP: St. Anthony’s shut out Xaverian 24-0 while Iona Prep downed Staten Island power Farrell, 38-8, to move on. These teams meet Week 2 with St. Anthony’s pulling away 31-21. Ryan O’Neil will attempt to air it out against a stingy Friars defense. St. Anthony’s has two great safeties and a string of three straight shutouts. It took every bit of 34 minutes, but top-seeded St. Anthony’s finally found the end zone Saturday night against No. 8 Brooklyn-Xaverian. The Clippers stopped St. Anthony’s at the goal line just before halftime, but the Friars erupted for three touchdowns on consecutive drives in the second half to pull away, 24-0, in a CHSFL Class AAA quarterfinal. Atiq Lucas helped get the offense rolling in the third, converting a third-down pass for 16 yards and breaking a 12-yard run on the next play. He set up the first touchdown with an 11-yard counter to the Xaverian 1-yard line. William Ruggiero scored the first of three touchdowns on the next play to put the Friars up 10-0 with 2 minutes left in the third. St. Anthony’s (8-1) amassed 348 yards of total offense, highlighted by 252 yards on the ground. Lucas accounted for 135 yards (87 rushing) while Ruggiero finished with 47 yards on 13 carries. Quarterback James Brady completed 7 of 16 passes for 85 yards and rushed for 55 yards on nine carries. The game marked the fourth shutout of the year for the defense, which has not given up a point in 12 straight quarters. St. Anthony’s will host No. 5 Iona Prep in a semifinal on Friday. Iona Prep advanced with a resounding 38-8 road win over Staten Island power and No. 4 seeded Farrell. Xaverian finishes 0-9. The maturation of Atiq Lucas took a quantum leap forward against Xaverian. Coach Rich Reichert promised to use the fleet junior back more come playoff time and 5-11, 175-pound Lucas responded with a stirring performance. He fumbled away his first carry and dropped a sure touchdown pass in a first half that mirrored the Friars’ sluggish offense. But Lucas proved to be a game-breaker in the second half. He finished with 135 yards of offense, including 87 rushing yards on five carries and three catches for 48 more. James Brady was sandwiched by Xaverian’s Davon Robinson and Oday Aboushi for a 4-yard sack, setting up third-and-10 from the St. Anthony’s 27-yard line early in the third quarter. The senior quarterback responded on the next play, firing a dart to Atiq Lucas for a 16-yard gain to keep the drive alive. The Friars drove 73 yards on 11 plays, scoring on a 1-yard burst by William Ruggiero with 2 minutes left in the quarter. Nicholas Ferrara’s point after kick put St. Anthony’s up 10-0. To say football is a physical game is to state the obvious. Injuries are part of the sport. And those injuries have cost St. Anthony’s some exceptional athletes this season. The latest is no exception. The Friars will have to make due — possibly for the remainder of the season — without one of the leaders on defense. Senior safety Dan Basil injured his neck in the first quarter of the regular season finale against Chaminade. If you were there, you watched helplessly as Basil lay face down on the turf until an ambulance arrived. It took a half hour in a steady downpour before the senior could be immobilized and carried off the field on a stretcher. The good news is that Basil is OK. There will be no lasting effects from his injury. But he won’t be allowed to suit up again this fall. Maybe that’s for the best. Basil suffered a possible concussion against Holy Trinity two weeks earlier. That’s enough trauma for one season. That just means teammate J.B. Andreassi must pick up the slack. Together they formed possibly the best safety tandem on Long Island. The 5-11, 186-pound Basil recorded 32 tackles, a pair of interceptions and a defensive score. The Friars won’t be able to replace him. But it’s everyone’s job to try. The end of another regular season gives us pause and brings two undeniable facts into focus. The first: parity has washed over the CHSFL Class AAA division. When 3-5 Mount St. Michael can count a win against 7-1 St. Anthony’s as part of its resume and No. 6 Chaminade can break out game film of its 7-6 win over No. 3 Holy Trinity, then the rule of the day says anything is possible. THE SCOOP: St. Anthony’s beat Brooklyn-Xaverian, 27-6, on the road Week 5. The Friars had their way with Xaverian, especially James Brady. The quarterback had running lanes open up again and again and used them to lethal effect. The score did not reflect just how dominating St. Anthony’s played. The Friars have only gotten better in the month since. Take the defense. Ever since giving up 30 points in a 42-30 win over Farrell, the defense surrendered a combined 20 points over the next four games. Now the defense must prepare for two quarterbacks with much different styles. Xaverian will likely play both strong-armed Najee Tyler and run-oriented Ethan Ostermayer. It just might be enough to cause confusion. But will it be enough to keep the teams close on the scoreboard? THE SCOOP: This is a rematch from Saturday, a 30-28 Staten Island-Farrell win. Farrell rallied for 14 fourth quarter points and then won it in overtime. The New Rochelle-Iona Prep defense has given up 92 points over the last three weeks and is winless over that span. That’s a tall order for the league’s top passer, Ryan O’Neil (1,732 yards, 17 TDs). If the Gaels win, it will be on his arm and with the help of some big plays on defense. Recent history is on their side. Iona Prep is playoff tough. It played for the title in 2005 and fell to St. Anthony’s in the semis a year ago. Farrell has won three in a row, and also boasts a dynamic quarterback in Michael Gentile. His top target is sure-handed receiver Anthony Evanelista. Farrell has reached the title game five times since 1998, but not since 2004. Anything is possible in this one. THE SCOOP: Chaminade held off Holy Trinity, 7-6, in Week 4 action. But Holy Trinity rebounded to win three of its last four games. Sophomore Anthony Brunetti has been the workhorse, although it was another back, Aaron McRea that carried the offense in the regular season finale, a 22-16 road win over Mount St. Michael. Quarterback Michael Lagalante (9 TD passes) has been a playmaker. Chaminade is coming off a gritty 17-0 loss to St. Anthony’s, the culmination of an up and down season. The Flyers have the tools on offense: quarterback Doug Vella, tight end Luke Nawrocki, versatile back Alexander Fox and kicker Gerald Levano. Chaminade has been victimized at times on defense, so that may hold the key. THE SCOOP: Staten Island-St. Joseph by the Sea beat Bronx-Mount St. Michael, 15-12, in Week 4. More importantly for the Vikings, they were able to put behind a humbling Week 7 loss to St. Anthony’s and rebound with a 28-7 win over Xaverian to close out the regular season. Sea’s double-wing offense is tough to stop. It takes a disciplined, physical defense to slow bruising back Patrick Brennan. Mount St. Michael quarterback Jayson Holt is at the heart of what Mount does. He’s lightning fast and can throw the bomb too. Mount played in the title game a year ago. Despite an inconsistent season, overall team speed and playoff experience give the Mountaineers a slight edge. On a rainy and windy night in South Huntington, St. Anthony’s wrapped up its regular season with a gritty 17-0 win over rival Chaminade. The defense registered eight sacks and held the Flyers to 79 rushing yards on 33 carries. James Brady ran for a 19-yard touchdown and junior Atiq Lucas led the way with 54 yards on eight carries and two catches for 33 yards. The top-seeded Friars (7-1) will host No. 8 Xaverian (0-7) in a CHSFL Class AAA quarterfinal next Saturday at 7:30 p.m. Defensive tackle Scott Vallone fought through double teams to wreck Chaminade drives. The 6-3, 265-pound senior put together his most complete performance this season, getting in on four sacks. He led a defense that brought down Flyers quarterback Doug Vella eight times and limited the Chaminade rushing attack to 79 yards. One play after James Brady threw into the end zone and was nearly intercepted by Chaminade’s Michael Riley, the Friars converted on third-and-7 from the Chaminade 15. Brady waited until the last second — drawing in Chaminade defenders — to pitch to Nicholas Mercurio. The fast back raced free down the right sideline for 13 yards. First down. William Ruggiero scored on a 2-yard bull run on the next play to put St. Anthony’s in front 9-0 with 1:49 left in the second quarter. With ESPN Radio (1050 AM) committed to covering Friday night’s regular season finale between two real rivals, you could excuse people for getting cranked up about the game. But the thinking behind the scenes hasn’t been about the game so much as getting the word out to some special alums. Both St. Anthony’s and Chaminade have sent more than their share of former football players to the military. The war on terror has scattered those veterans around the globe, from Baghdad to Kabul. And in those war-torn envirnments, nothing offers a reprieve more than some American-style football. Well, if those soldiers can get to an Internet connection, they’ll be able to tune in. The game will be simulcast on the radio station’s Internet site. THE SCOOP: Chaminade beat Mount St. Michael, 15-14, thanks to a 34-yard field goal from Gerald Levano as time expired on Saturday. It was typical Chaminade, at least this season. The Flyers also won a heart-throbbing 7-6 decision against Holy Trinity. Stopping the run has been the main problem in losses to Farrell, Iona Prep and St. Joseph by the Sea. Alex Fox is a dual threat out of the backfield and Doug Vella, who completed 18 of 35 passes for 294 yards a week ago, can air it out. The Friars have been outstanding on defense and nearly impossible to beat deep. How well the Flyers bottle up James Brady will determine whether this one remains close. It was 7-0 St. Anthony’s versus 6-1 Chaminade under the lights at Hofstra. Keith Shannon made it a one-sided affair. The Friars senior rushed for 97 yards on 19 carries and scored four touchdowns while the defense held Chaminade to minus 2-yards of offense in the first half. James Brady completed 6 of 9 passes for 109 yards and John Gagliano added 51 yards on 11 carries.